WAM DUBAI, 2nd August, 2013 (WAM)– Etihad Airways today brought together two elite sporting forces at Endeavour Quay in Gosport in the south of England, as five of the Harlequins team including England and Harlequins captain Chris Robshaw swapped tackles for tacking, to throw their considerable weight behind Volvo Ocean Race contenders, Abu Dhabi Ocean Racing. More familiar with the expansive turf of the Twickenham Stoop than the cramped quarters of Abu Dhabi Ocean Racing’s yacht, Azzam (Arabic for “Determination”), Harlequins players Robshaw, Nick Easter; George Lowe, Nick Evans and Ben Botica, had their sailing skills tested on the Solent – a stretch of water between Hampshire and the Isle of Wight – by Abu Dhabi Ocean Racing skipper and double British Olympic medallist, Ian Walker. The two high-performance teams were brought together by United Arab Emirates’ (UAE) flag carrier Etihad Airways, a partner of both Harlequins and Abu Dhabi Ocean Racing. 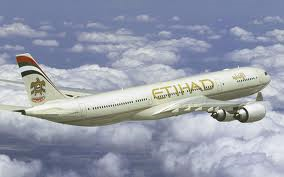 Etihad Airways’ Chief Commercial Officer, Peter Baumgartner commented: “It is fantastic to be able to bring together two teams of outstanding sporting pedigree, both of whom we are hugely proud to support. “Harlequins are in the middle of their pre-season training as they prepare to launch their campaign to reclaim the AVIVA Premiership Trophy they won in 2012. “It is also a great time to be associated with the Abu Dhabi Ocean Racing team in the build-up to the Volvo Ocean Race next year, which will call into our home city of Abu Dhabi in December 2014.” Chris Robshaw revealed his troops were keen to swap tips and tactics with Walker, who has two global Volvo Ocean Race circumnavigations under his belt and is preparing for a third attempt in the nine-month, round-the-world sailing odyssey when it starts in Alicante, Spain, in October 2014. “There are strong similarities between our two sports. Determination, focus, physical and mental strength – these are hallmarks of any great team. Whether you are out on the pitch or sailing in some of the roughest waters, you have to know that the guys around you will support you no matter what. “Saying that, these sailors have to perform at 100 per cent for up to 30 days at a time, their lives depend on it. That takes a special type of athlete,” said Robshaw, who led Harlequins to the 2011-12 Aviva Premiership title. Sailing off the UK’s South Coast in preparation for a fortnight of crew selection and high-profile races, Walker said that the Harlequins players would be welcome additions to Abu Dhabi Ocean Racing any time they fancy trading grass for waves. “These guys have a winning mentality and certainly have the brute strength to deal with the extreme rigours on board. If they can get their sea legs, there’ll always be a place for them with us – although we might have to get some bigger kit made up to fit them,” said Walker, who skippers the Abu Dhabi Tourism ‘&’ Culture Authority (TCA Abu Dhabi)-backed outfit. Abu Dhabi, the UAE capital and home of Etihad Airways, will host the third 2014-15 Volvo Ocean Race stopover from mid-December 2014 until 3rd January 2015. Abu Dhabi will welcome the fleet from Recife, Brazil after one of the longest and potentially most-gruelling legs in the 40-year race history (9,707 nautical miles). The Abu Dhabi Etihad Airways In-Port Race, which the home favourites won in the globe-spanning race’s last edition, will take place on January 2nd 2015, with the fleet departing for Sanya, China, the following day.